I made a big Sunday dinner last night. Not that I don't cook every night, but last night was a treat...there was roasting, baking and sauteing involved. I know I have talked about it before, but we are really working on lowering our food budget and eating a little more earth friendly, so when meat is involved it is a "treat" for the boys. They are actually really good with this plan. Thank goodness! In fact, we are making a lot of food compromises lately. You see, I am not a huge fan of rice. However, I like brown rice. So, the illustrator and I have been talking a lot about how we eat and how to incorporate more of our (our meaning everyone's) favorites and how to improve things so we all like what we are eating. I also feel it's important for our meals to have the same basic components. I thought the brussels sprouts were going to be the best part of dinner last night, but really the whole thing made us ALL happy! The menu last night was oven roasted chicken (boys), chickpea patties (me), sauteed brussels sprouts and "not" chick'n flavored rice with peas and carrots. YUM! 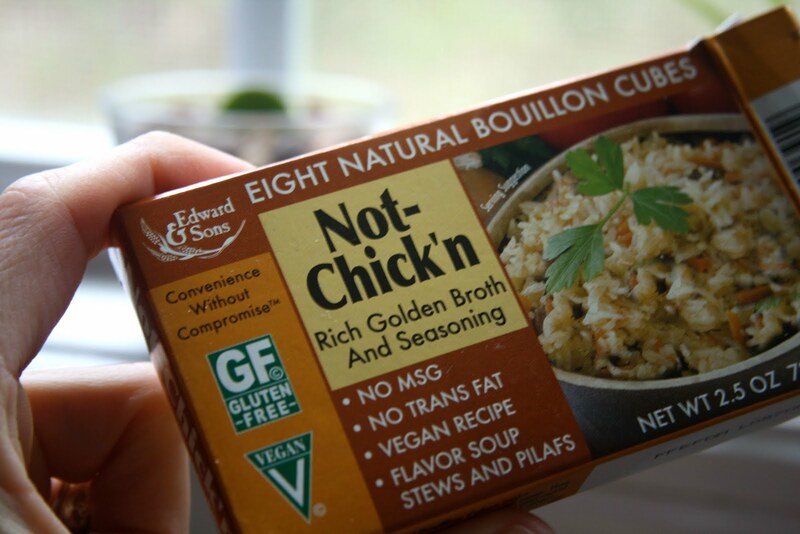 Have you tried the Not-Chick'n broth yet? Oh my gosh, it is the best I have ever tasted before! The illustrator will back me on this too! Every time we run out of it, he tells me it needs to be a new staple. The man is all about his staples. We LOVE it! The other part that made the rice so good...frozen peas and carrots! Jay meet vegetables...vegetables meet Jay. This morning, he actually told me that it was the best chicken flavored rice he ever had. I realize he is 12, but I will take that. I was afraid the peas and carrots would get mushy, but I added them in the last 20 minutes to the top of the rice so they essentially steamed and they were perfect! 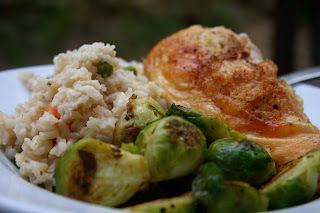 Oh and just for HEAB...the boys' brussel sprouts were sauteed with rendered bacon fat. 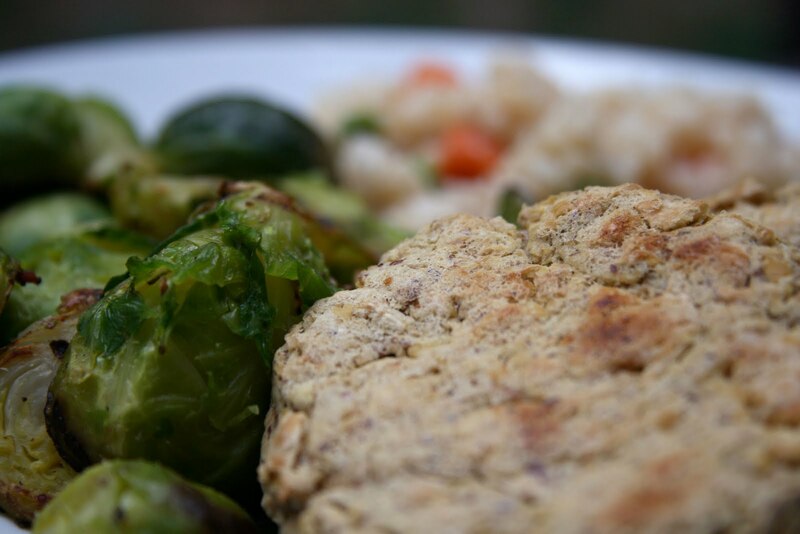 Mine were sauteed with delicious coconut butter! I am off to enjoy the leftovers! Does it feel like fall where you are? I bet that broth would be amazing to cook quinoa in! I need to get my mitts on some of that broth! i need some of those cubes! it's always too much of a pain to make/carry home veggie stock. Oh YAY on the cooler temps and awesome morning. The heat and humidity is creeping back on here. We aren't in the 100's though so no major complaining. I use that brand of bouillon for my sietan - also use the "beef" flavor. Hope you have a great evening! I am not a huge fan of rice either, but sometimes it is a nice change! 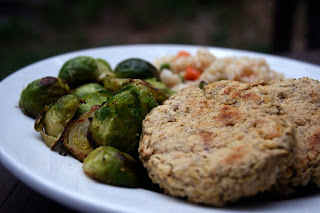 The meal looked great...and brussel sprouts are one of our favs!! We are looking forward to fall weather, still a little hot here! I love the slight chill in the air right now! It may still get to the 80s during the day, but feeling the 70s in the morning sure is nice. Looks like a great meal. 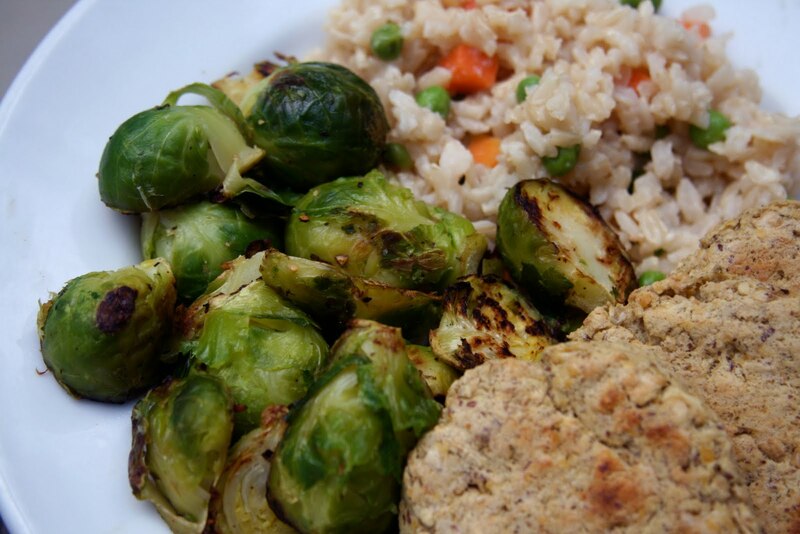 I adore brussel sprouts. Cooking them in coconut butter sounds amazing. I love the feeling of a good morning workout!! I'm soooo ready for fall! i'm glad you had a ncie walk this morning! had you asked me last week if it was starting to feel like fall, i'd have said yes quite readily. but this week is back to the 90s and SUMMER! I will have to be on the lookout for that broth! I WISH fall was in the air here! I love that you sauteed your brussel sprouts in coconut butter! Yum!!!!! I love sunday dinners! They were always a huge thing growing up in my house, it was pasta Sunday dinners, my mom would have a pasta feast! I wish it was cooler here -- it was cooler last week and then all of sudden it was back to 80-90 degrees. Yuck! I am so ready for Fall and (dare I say) winter?? ?